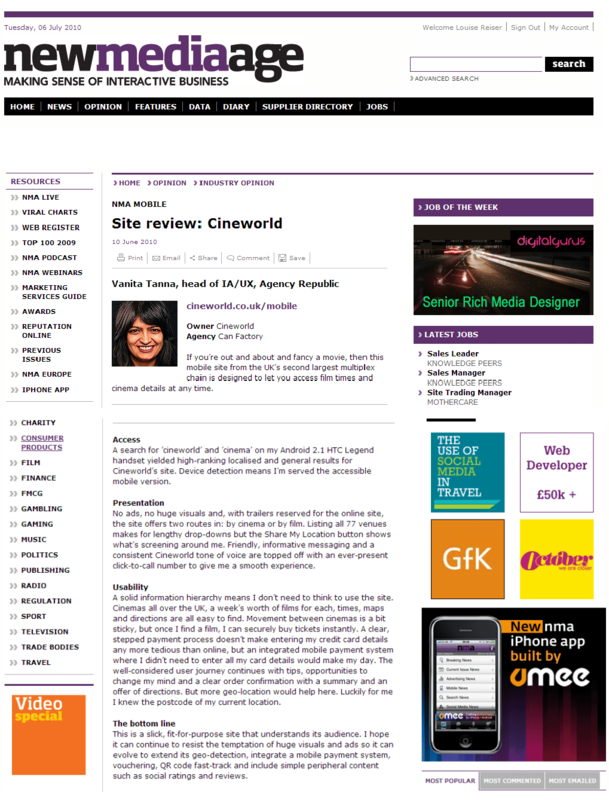 Can Factory first encouraged Cineworld’s eCommerce team to implement a dedicated mobile website in 2009. Initially we recommended a streamlined site to allow for the 2009 UK marketplace’s sluggish mobile connectivity and low levels of smartphone adoption. In August 2009 the site launched focusing on putting key cinema, film and performance information into the user’s mobile device in a format that could be downloaded quickly and navigated easily. 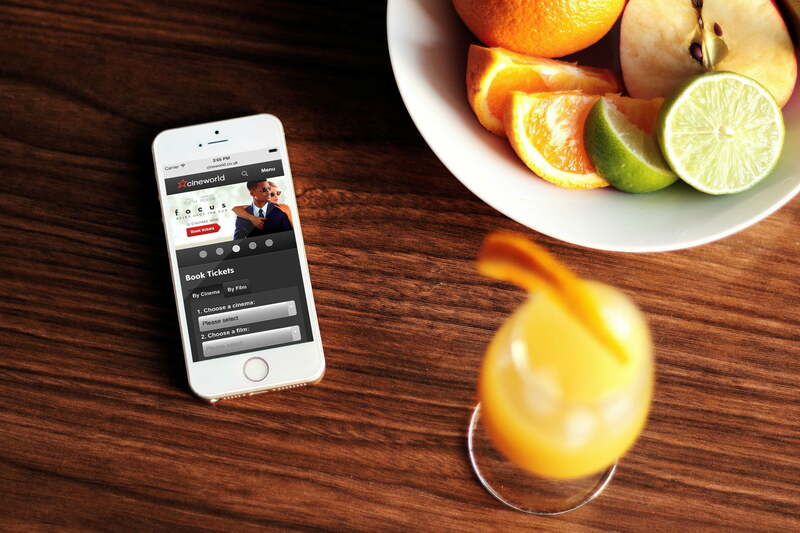 Most importantly the solution had to ensure that customers could book as easily as possible on a wide variety of mobile device platforms. The solution also took advantage of the fledgling location browser support available at the time to dynamically display more relevant results to users. Pointing out on the usefulness of the Share My Location button, “which shows what’s screening around me,” Ms Tanna described the “friendly, informative messaging and consistent tone,” and approved the choice to dispense with ads and huge visuals in this “accessible mobile version” of the Cineworld Cinemas site. The site proved such a success1 that it wasn’t until 2013 that the Cineworld eCommerce team decided it was time to give the mobile website a refresh. Improvements to smartphone market penetration, the capability of the mobile devices available and consumer mobile bandwidth speeds resulted in significant increases to usage2, which provided a strong rationale for a major Cineworld mobile website update. The benefits of implementing a responsive mobile website were considered – for example, the maintenance of a single set of templates. However, the decision was taken to develop a site that could be explicitly customised for specific mobile user journeys. Expanding on the basic mobile site, Can Factory worked with Cineworld’s eCommerce team throughout 2013 to redesign the solution to encompass a wider breadth of content, until eventually every page on the site had a dedicated mobile template. This development also coincided with the introduction of eTicket support, which further improved booking conversion for customers trying to bust the queue during peak times. As improved mobile devices and connectivity continue to put more power in the hands of users, the Cineworld site will need to continue to grow to cope with perpetually increasing demand driven by customers who are becoming increasingly comfortable purchasing when they’re on the move. 1 700K unique visitors in the first 3-months.